Don’t you just LOVE Italian? I guess by now even the slowest-witted person could figure out that I do. Very much so. The first time we went to Italy, when Yonatan was still in his architectural period, we were invited to spend a year with two Italian architects working in Friuli, an Italian province bordering with Slovenia, on restoration of mediaeval castles. Getting ready for this adventure, we took a very basic course at the Italian Cultural Institute in Tel-Aviv. The teacher, who we still fondly recall, walked into the classroom and started to speak fluent Italian – explaining to us what the course will be about, what she wanted us to do etc. For a few minutes we were all dumfounded, but then gradually we saw that if we just listened to the music of the language, together with the expressive body language the teacher helpfully used, we could actually figure out what she was saying. Ever since then, I fell in love with Italian. As you may know, Italians speak basically only Italian, (that includes university professors, employees of international companies, and tour guides working in the Tourist Information Offices…), so we had to learn fast. Real fast. Over the years we have gradually moved from basic stuttering – just to be able to buy tomatoes at the market, to basic conversational skills – which I had to develop very quickly I order to communicate with my son’s kindergarten teachers, to almost fluent Italian. Still, there comes a wonderful word like “Bombatura” and blows me away…. 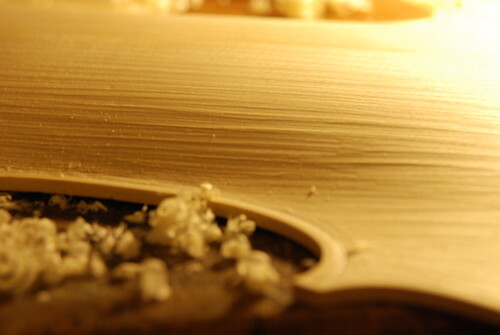 Bombatura is one of the most important processes in making a stringed instrument, by which the rough arching carved from the blocks of wood that will become each instrument’s front and back, is painstakingly carved and shaped into the final arch that defines the instrument’s body, volume and character. 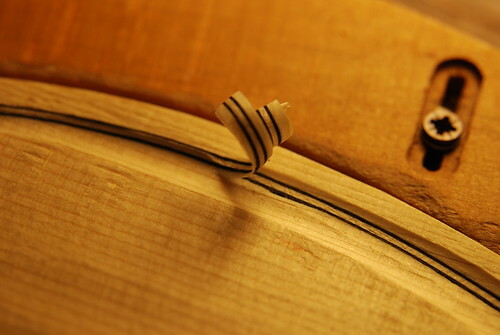 While the mold helps shape the contours of the violin, it is two-dimensional by definition, and so there is actually nothing but the violin-maker’s eye that helps mark, shape and sculpture the instrument’s arching. Yonatan loves this part of the process the best – exactly because he is not constrained by a model (even not by his own model…), and needs to use his eyes’ extraordinary ability to three-dimensionally-imagine what the violin (viola… cello…) will look like. Then, when the general shape of the instrument’s body has been sculptured – because honestly more than anything else, this phase involves sculpturing the wood into the carved, unique, hand-made shape that will give the instrument its body and character – the really exact tools come into play. 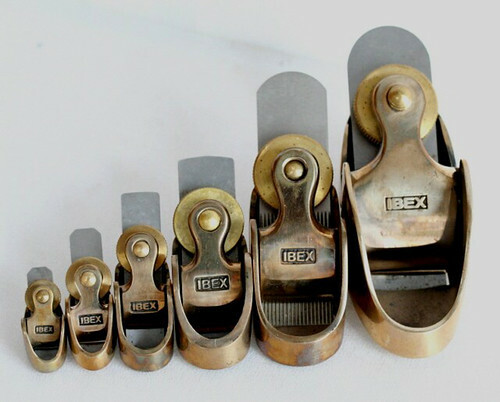 Yonatan uses special planes called “thumb planes”, which look more like Jewelry than like wood-working tools, and come in numerous sizes. So finally – one last picture of the way the cello, the viola and one violin look by now, ready for the very last phase of the Bombatura process – what, did you really think that’s it?? – which I’ll write about next week.